Parallels is pretty great software that lets you easily run Windows apps on Mac OS X. The latest version was just announced and is faster than ever with full 64-bit support, it retails for $79.99 which isn’t a bad price but why pay more when you don’t have to? I like a good deal, so here’s how to get the newest version, Parallels 6, for $20 (well, actually $19.99). This will work until September 30 when the rebate is no longer offered. Buy a qualifying Parallels Desktop 5 for Mac product from an authorized reseller or from www.parallels.com starting August 15th, 2010 and you will be eligible upgrade to Parallels Desktop 6 for Mac at no additional cost when it becomes available on September 14. Save your Parallels Desktop 5 for Mac dated sales receipt, register your product and activation key at https://www.parallels.com/account/ and keep your activation key in a safe place. 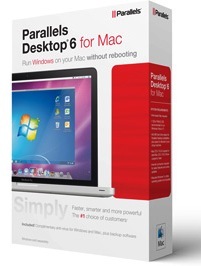 Bookmark this page and come back once Parallels Desktop 6 for Mac has been released in your language. Great software at a great price, can’t beat that. Update: This deal is still active, you have until November 30th, 2010 to buy Parallels 5 and then get a free upgrade to Parallels 6. This is a great deal! Not a paid advertisement.. But I’ve been using parallels to concurrently run windows XP (later windows 7 and fedora) since 2007 and swear by it.. I just paid 49 bucks for the parallels 6 upgrade- so I can say it’s worth a 20 dollar investment. I have a company issued laptop that I simply no longer use. I live in UK the cheapest I can find parallels 5 is £52 which is around $80 this is disgusting we have to pay so much more than US. Or get VirtualBox which is free and, in my experience, faster and more reliable than Parallels. the problem with virtual box is it can’t boot up the ‘boot camp’ partiton. so u can’t have windows as standalone.